It’s hard to lament Comic-Con’s lack of focus on actual comic books when the convention also brings us some of the best and exclusive collectible toys of the year. 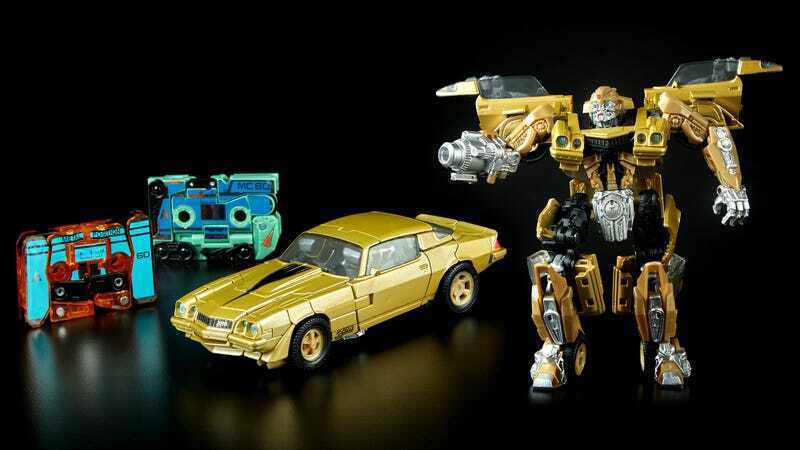 In addition to new figures of Star Wars’ latest heroes, Hasbro will be tapping Transformers fans’ wallets with a new Bumblebee set featuring a retro gold Camaro and a pair of rare dinosaur cassette bots. The ‘80s-inspired “Bumblebee Vol. 1 Retro Rock Garage” set includes a classic 1977 Camaro version of Bee with a retro paint job that will undoubtedly match the character’s design in the upcoming Transformers prequel. But with 25 steps needed to transform the toy from car to robot mode, this version of Bumblebee doesn’t share much else with the comparatively simple Transformers toys of the ‘80s. The set’s packaging looks like an oversized cassette tape, while the ‘rock’ theme is carried on through the other two included Transformers figures. As a kid, Soundwave’s tiny cassette bots were my favorite Transformers toys (they were so easy to smuggle in your pocket) and in this set Bumblebee is joined by Dairu and Uruaz, a pair of dino-cassettes that were originally only available in Japan back in the ‘80s. If you’ll be at San Diego Comic-Con this year, you’ll be able to get the “Bumblebee Vol. 1 Retro Rock Garage” set at Hasbro’s con store for $60. But if you can’t make it out west, some will also be made available on the HabroToyShop website after Comic-Con is over, but in limited numbers. What Movies Are Coming to San Diego Comic-Con 2018?